Place the bacon in a large pot with enough water to cover it. Bring to the boil, take down to a simmer, put a lid on and let it bubble away. You should allow 30 minutes per 450 grams (1 pound). Check the water level now and again and add more if needed. When the bacon is cooked, remove it from the pan, place on a warmed plate and tent it loosely in foil to keep it hot while you cook the cabbage. Finely chop the parsley. Melt the butter in a small saucepan on low heat, then add the flour and stir it well so you get a smooth paste. Add the milk and the cream, mix well and cook for about 5 minutes. Add the mustard, parsley and salt. Mix well, then have a little taste. Keep the sauce warm until you're ready for it. The consistency should be thick enough to coat the back of a spoon, but not so thick that you can stand the spoon up in it. Shred the cabbage into fine strips and pop them into the bacon cooking water. Simmer for 10 minutes, then drain and serve. If you're not a fan of fat, trim it off, then slice the bacon thickly. Serve with the cabbage, two or three boiled potatoes and a goodly amount of sauce. The video above is from the Keef Cooks YouTube channel. 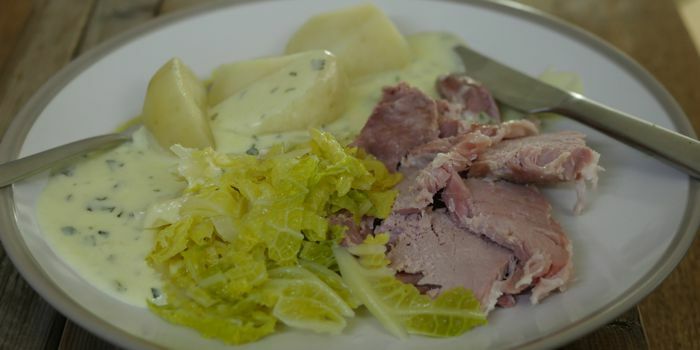 Click here to see the video recipe of Boiled Bacon and Cabbage with Parsley Sauce on YouTube.